We accept small grant applications to the Mayor’s Small Grant fund which are up to £300. There is no deadline for these applications and they are assessed on a rolling basis until funds are depleted. Please click Mayors Grant application form 2018-19 to download the application form. 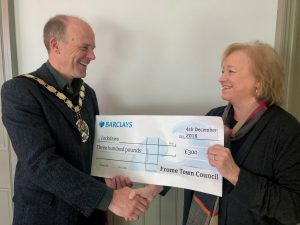 This fund is for applications of £300 – £2k from groups and organisations who can demonstrate that their proposed projects will have a positive impact on the Prosperity, Environmental Sustainability and Health and Wellbeing of Frome residents. The next grant round opens on the 1st April 2019 and closes at 5pm on Wednesday 29th May. The aim is to enable access to sports and activities for all (young, old, sporty, not at all sporty etc!). Are open to all and not selective in your membership. Offer individuals/groups the opportunity to take part in a sport or activity where access to such an opportunity may otherwise be restricted. The sport or activity you offer takes place within the BA11 postcode.